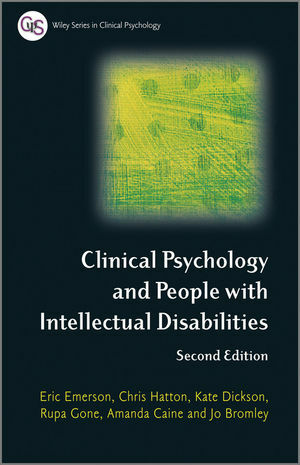 Clinical Psychology & People with Intellectual Disabilities provides trainee and qualified clinical psychologists with the most up-to-date information and practical clinical skills for working with people with intellectual disabilities. All chapters have been fully updated with the latest evidence. New chapters cover working professionally, working with people with autism and addressing aspects of the wider social context within which people with learning disabilities live. Eric Emerson is Professor of Disability & Health Research at Lancaster University, UK, and Visiting Professor in the Faculty of Health Sciences at the University of Sydney. Kate Dickson is a Chartered Clinical Psychologist at the Betsi Cadwaladr University Health Board in North Wales. Rupa Gone is a Chartered Clinical Psychologist at Hertfordshire Community Health Services in Watford. Chris Hatton is Professor of Psychology, Health and Social Care, Lancaster University, UK. Jo Bromley is Consultant Clinical Psychologist, Service Lead for the Clinical Psychology Service for Children with Disabilities, Central Manchester Foundation Hospital Trust. Amanda Caine was Consultant Clinical Psychologist and (late of) Professional Lead for Clinical Psychology, Pennine Care NHS Foundation Trust.